"You killed it with these videos! as a trainer I would suggest this to other trainers and trainees alike." The PDF cueing and videos will give you the knowledge and support you need to feel confident. Lifetime access allows you to review and apply Movement 101 on your own time. Written explanation of the set-up, movement phases + muscles used in each exercise. PDF with photos + movement breakdown & muscles used. HAVE IT ON ANY LEVEL? KNOW SOMEONE WHO DOES, WHO YOU COULD HELP THROUGH LEARNING THE TECHNIQUES IN MOVEMENT 101? The first couple seconds of the breathing video debunked all the breathing techniques I had learned. it's nice to learn howto properly breathe for relaxation & for lifting weights. Should have had this years ago when I started out. Your detail and enthusiasm makes you want to start in straight away. I’m a “retired” collegiate athlete (whatever that means lol) and I have dealt with and hidden most of my injuries to perform or keep up. AFTER just doing THE FULL BODY FLOW WARM UP, I FELT AMA-ZA-ZING! You killed it with these videos! as a trainer I would suggest this to other trainers and trainees alike. Thank you annie! I can't even begin to thank you for the value inside this resource. The videos alone are amazing. Thank you for focusing on form and spreading in such an applicable way. Keep diong what you're doing! there's so much crap out there. this debunks it all and makes so much sense annie. thank you so much for the time and value you put into this! it's truly refreshing. I use the full body flow warm up everyday. Just having a proper comprehensive warm up has been a game changer for me. my hips feel so much better afterwards. I would definitely recommend Movement 101 to other trainers and people just looking to workout because you did a fantastic job explaining ideologies, terminologies, and your preferences clearly. I have a degree in both Nutrition and Exercise Science, but I had always been scared to lift at the gym (more specifically afraid of making myself look like a fool in front of everyone while squatting and deadlifting). I purchased Movement 101 and it has taught me so so much. I am now more confident to go to the gym and lift heavy, (and I’m loving it!) I now look forward to going to the gym! The written instructions + videos is almost as good as having you at the gym with me, telling me what to do. Plus I like being introduced to exercises I likely wouldn't do otherwise. it's better (and cheaper) than paying a trainer who doesn't know what the F they're talking about. I've worked with trainers in the past who I felt were just throwing a one-size fits all approach out there to make $$$ and advocating a program that didn't feel good to me. I love what you do. I love the realness. I love the science-based approach. 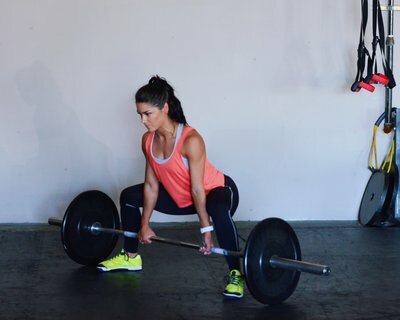 I love feeling empowered to lift correctly without fear of injuring myself. I am actually enjoying lifting for the first time EVER. When I've done it regularly in the past I got sooooooo boooooooored. But it's feeling like a great challenge now and I'm actually doing more strength training than cardio these days and seeing great improvement. So yay! I feel like I'm building a foundation that will help me age without injury (I'm 43), stay active longer and retain the mobility that's so essential for playing sports and staying active as you get older. Is there a start and end date? Negative. This is a resource to use whenever you see fit forever and ever amen. Will movement 101 fix my injuries? No ma'am. Well, we can't guarantee that. It WILL help improve your movement patterns and body awareness, however. It was not designed to "fix" injuries. Moreso help assist in injury prevention and long term quality movement patterns. p.s. the resource page with be of high value to you IF you happen to have an injury. What if I already have a lifting program? AWESOME! Movement101 is a supplemental resource designed to HELP with whatever program you might already be following. It is an educational, practical resource, not a workout program. What if I have questions while going through movement 101? I welcome you to our Educated Movement Facebook group! Ask all the questions and share your successes. If you have a question you're not comfortable asking in the FB group, you can always drop me a line. WHAT IF I DISCOVER PAIN WHILE GOING THROUGH MOVEMENT 101? I give you the RESOURCE PAGE in the PDF I give you access and links to professionals in the field who specialize in mobility and rehabbing athletes so that you can move well without pain. will I have to pay more than one time for updates? Girl, you are IN for LIFE. If updates are made to Movement 101 they will simply be added to the dropbox folder and appear for your use! You pay once. Period. WHERE WILL I ACCESS ALL THE THINGS? Once you make your purchase, you'll get a link to a dropbox folder that has everything you need. As long as dropbox exists, you have access. You are free to download the 100+ videos and PDF as you wish. & I am here to help educate. I make movement simple for you. I give you the details you need to understand and leave the rest out. Movement should lead to longevity, not injury. Through my education + experience with injuries I made Movement 101 for those who wish to feel confident and aware with their movement patterns. All movement starts with just you and your body. Work your way through body weight, dumbbell, and barbell movements + explore the bonus content and additional resources in movement 101.